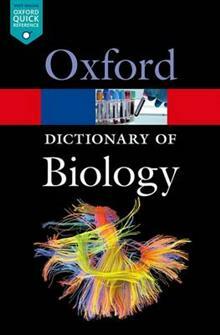 Fully revised and updated for the seventh edition, this market-leading dictionary is the perfect guide for anyone studying biology at school or university. With over 5,500 entries - over 250 of them new - it provides comprehensive coverage of biology, biophysics, and biochemistry... read full description below. Edited by Hine, Robert C.
Fully revised and updated for the seventh edition, this market-leading dictionary is the perfect guide for anyone studying biology, either at school or university. With more than 5,500 clear and concise entries, it provides comprehensive coverage of biology, biophysics, and biochemistry. Over 250 new entries include terms such as Broca's area, comparative genomic hybridization, mirror neuron, and Pandoravirus. Appendices include classifications of the animal and plant kingdoms, the geological time scale, major mass extinctions of species, model organisms and their genomes, Nobel prizewinners, and a new appendix on evolution. Entry-level web links to online resources can be accessed via a companion website.